Krishna offers betel nut to his beloved Radha and envelops her in a gentle embrace in this unusually large composition. Their union is often interpreted as a metaphor for the joining of the earthly realm (Radha) with the divine (Krishna). Although Krishna is a cowherd and Radha a village woman, they wear elaborate robes and precious jewels. 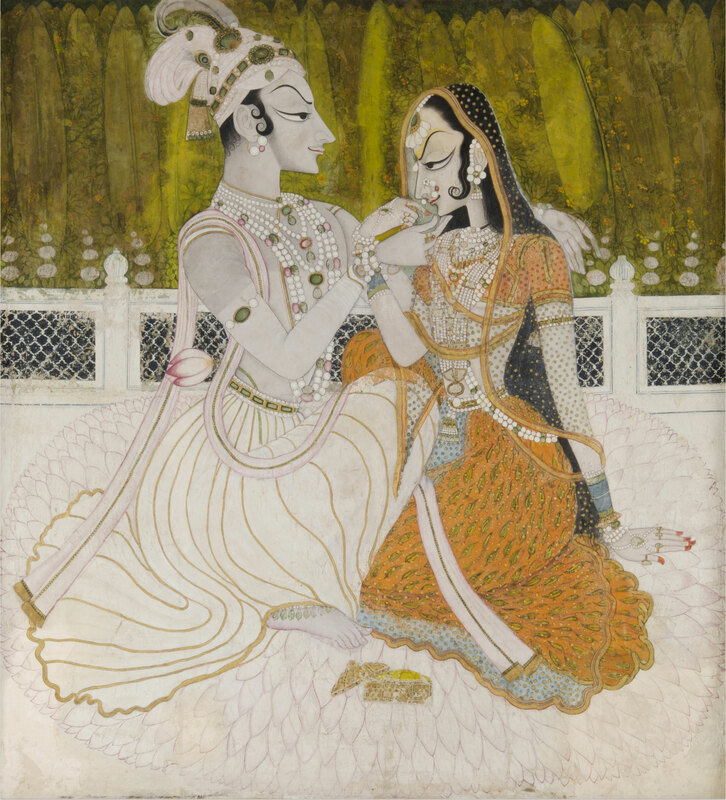 Their intricate ornamentation—from the flower on Radha’s forehead to the anklet visible beneath Krishna’s robe—elevates them to royal status, hints at their amorous relationship, and emphasizes their divine identities. Composed with utmost subtlety of line and color, this unusually large painting of the Hindu god Krishna and his loved one Radha might be the work of Nihal Chand, a master of the Kishangarh school trained at the imperial court in Delhi, to whom only a few paintings can be attributed. On a white terrace, seated on a large lotus flower, a princely figure in a gesture of endearment offers a betel leaf to the lips of his beloved. Like another lotus, the man's garment envelops his seated posture; in his belt is a lotus bud, as tender as the touch of the woman's hand that rests on the floor. The sharp-featured, slender figures resemble one another; they carry the dream of each other under the eyebrows vaulting high above lowered lids that veil their emotion. Theirs is the intimacy of lovers and the stillness of icons. Stella Kramrisch, from Philadelphia Museum of Art: Handbook of the Collections (1995), p. 59.